The Parc del Laberint d'Horta is outside the tourist trails. Here you can enjoy the peace and quiet that is otherwise hard to find in Barcelona. In the 18th Century by the Marquis Desvall for the Catalan nobility properly, the Parc del Laberint is today the oldest remaining parking facilities in Barcelona. Enter the park, there is on the right side, half hidden behind a wall, a romantic castle, which is copied a Moorish castle with octagonal floor plan and crowned with delicate battlements. This building is the Palais of the family Desvalls, the builder of the park. You can reach the parc with the metro and a short walk. With the Barcelona Card you have free use of public transport. The entire Parc del Laberint is divided into the traditional park and the romantic garden. Go straight from the castle along the rising way, you come to the older part of the park, which consists of three terraces classical plant. Start with the establishment of the park which was in 1791. It contains many elements of Greek mythology and is devoted in many ways of love. You can find many sculptures, streams and ponds. At the lowest terrace is the 1792-based labyrinth from which the Parc del Laberint has its name. 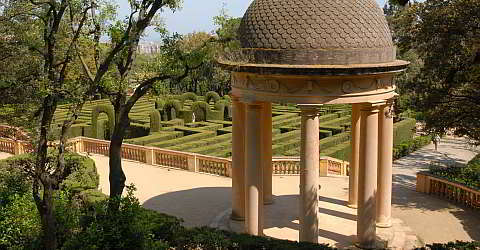 The labyrinth consists of about 750 meters cut cypress hedge. In the centre of the labyrinth awaits a statue of the huntress Diana and with a bow armed Amor to the hideout playing visitors. At the end of the labyrinth rests in an open cave the guardian of the park, a source nymph. In the middle of the garden there are two small temples which are dedicated to Artemis and Danae. At the stairs to the third terrace is a statue of Dionysus, the god of wine. The temple served mid-19th Century as a backdrop of classical plays. On the third and uppermost terrace you see a classical pavilion. This is dedicated to the nine Muses. Before the pavilion a water basin fed of a fountain, and it is dedicated to the nymph Egeria. The descendants of the Marquis Desvalls enlarged 1880 the Parc del Laberint with a very delightful and pleasant shady and Romanesque garden directly to their property. There were ways and places in the shade of large trees. There was also a replica of a medieval cemetery, which why this part of the park is as a counterpart to the classical part and probably applies to the death warning. From the Roman part is only slightly preserved, the today's design, however, after the original plans. The park is located in a very large Mediterranean forest, which pulls up the slope. The 9.1-hectare Parc del Laberint was in 1967 in possession of the city of Barcelona and since 1971 it is open to the public and also serves as a botanical museum. In 1994, the Parc was restored. The Parc del Laberint d'Horta is located on a slope of the Collserola, on the Olympic bycicle stadium. You can reach the Parc del Laberint from the metro station "Mundet" (line L3). From the subway station go at Olympic Bycicle Stadium to the park There are about 500 meters to walk up the slope. Adice: maximum 750 people let in at the same time. Wed. and Su. free admission. From the metro station Mundet (L3) it will take about 15 minutes by feet. For the visit you should schedule about 1.5-2 hours.